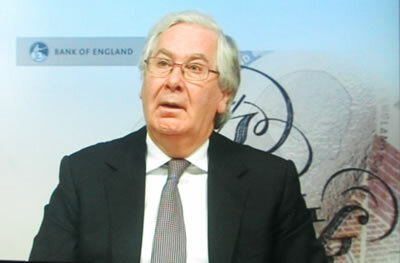 Mervyn King along with Bank of England's Monetary Policy Committee having spent virtually the whole of 2010 pumping out temporarily high inflation propaganda so as to prevent a wage price spiral from taking hold, now on having looked at preliminary data for January 2011 inflation to be released in Mid Feb, effectively admits that the Bank of England has lost control of Inflation and the Economy as the latest GDP data shocked everyone by showing a disastrous contraction of -0.5% for Q4 2010 against expectations for +0.5% (1% difference). "CPI inflation was 3.7% at the end of last year, and... is likely to rise to somewhere between 4% and 5% over the next few months, before falling back next year." "In 2011 real wages are likely to be no higher than they were in 2005. One has to go back to the 1920s to find a time when real wages fell over a six year period." The Bank of England repeatedly warned the British population to ignore high inflation throughout 2010 as each quarterly inflation report proceeded to always forecast an imminent drop in CPI inflation and a sub 2% rate in 2 years time. The Bank of England's Feb 2010 Inflation Report forecast the spike above 3% as being temporary and to imminently to resolve in severe disinflation to target a rate of below CPI 1% by December 2010, instead UK Inflation for Dec is 3.7%. The May 2010 Inflation report continued with the mantra of temporarily high inflation that would resolve in a rate of about 1.5% by the end of 2010, on the basis of spare capacity in the economy, the blatant flaw in the Bank of England's argument was the fact that much if not all of the spare capacity had been destroyed during the Great Recession of 2008-2009. The mantra of spare capacity, downward pressure on wages to resolve in disinflation continued in the August 2010 Inflation Report. However now with most of 2010 gone, The CPI target for 2010 was revised higher to 3% from 1% (Feb 2010), with CPI for 2011 forecast to again resolve in CPI 1%, and a sub 2% CPI in 2 years time. The Bank of England's most recent Inflation Report (November 2010) now forecast UK CPI Inflation to target an early 2011 spike of 3.5% before inflation falls to below 2% CPI by the end of 2011 to target a rate of approx 1.7%, and for inflation to remain well below 2% into the end of 2012, therefore supporting the Bank of England's persistent view that everyone should focus on the Deflation threat and ignore high inflation during early 2011 so as the Bank of England can continue to keep interest rates well below the real rate of inflation for the purpose of funneling savers and tax payers cash onto the balance sheet of the bailed out banks. The 2010 Bank of England Inflation reports clearly illustrate the persistent trend as was the case for virtually every preceding year in that the Bank of England ALWAYS FORECASTS SUB 2% INFLATION in 2 YEARS TIME. Clearly the Bank of England relies on the gold fish memory of the mainstream press as the BoE seeks to revise inflation forecasts every quarter to always push forward sub 2% to two years forward, which is nearly always preceded by a trend to below 2% one year forward. In reality the quarterly inflation reports are just propaganda aimed at psychologically managing the populations expectations on the economy and inflation in the direction of where the BoE wants it to be, as the alternative would be to make the BoE's job harder. My recent in depth analysis and CPI Inflation forecast for UK Inflation (17 Jan 2011 - UK Inflation Forecast 2011, Imminent Spike to Above CPI 4%, RPI 6% ) concluded that the Bank of England in fact was never in control of inflation, but rather enjoyed a period of benign economic conditions during Labours early years as a consequence of the inflating credit bubble and China exporting deflation abroad. Additionally, the analysis concluded in what is a clear fact that the Bank of England has not been targeting 2% inflation for sometime but instead 2% GDP. My forecast trend for UK Inflation for 2011 is illustrated by the below graph that concluded in a spike higher to above 4% on release of January data in mid Feb 2011, to be followed by a downtrend into the end of 2011 to target 3% as a consequence of a stagnating economy. At the end of the day high Inflation is a stealth tax that is being used by the Government and the Bank of England to a. Reduce the budget deficit (eroding purchasing power), and b. funneling tax payers and savers cash onto the balance sheets of the bailed out but still bankrupt banks, as savers are in receipt of interest net of tax at half the CPI rate and similarly average workers pay rises at near half CPI and far below half RPI inflation of 4.8%. Britain's workers have lost 12% of the purchasing power of their wages during the past 3 years as a consequence of Labour Government spending incompetence and The Bankster Fraud that continues to pay out bonuses on the basis of fictitious tax payer funded profits. High UK inflation not just for 2010 and 2011 but for the next decade ensures that the people of Britain are going to suffer and living standards fall year on year, only punctuated by one off debt fuelled election booms / recoveries such as that which Labour initiated into mid 2010 and that which the Coalition government aims to initiate into May 2015, only to be followed by several years of pain, welcome to the Inflation Mega-trend (ebook free download). The UK Economy apparently went into reverse gear on release of shockingly bad preliminary GDP data for Q4 2010 of -0.5%, against economist expectations averaging at +0.5%. George Osbourne and other Coalition government ministers immediately stepped forward to blame the weather. However the snow at worst accounts for -0.4%, therefore most of the drop of 0.6% (1% difference) is due to retrenchment ahead of austerity to bite during 2011 as private sector firms seek to protect themselves against weaker demand by bolstering balance sheets. Therefore UK economy can be expected to recoup the -0.4% contraction due to weather during Q1 2011, which implies better GDP for Q1 than originally forecast as economic activity literally froze during December now takes place during January and February (barring further bad snow fall). Additionally the preliminary data is deemed to be overly gloomy, and thus can be expected to be revised higher from -0.5% towards -0.2%, therefore net difference between actual and expectations is estimated at 0.3%, far lower than the 1% headline difference as the UK economy is not quite as weak as the all of the press headlines suggest. My expectations remain for Growth of between 1% and 1.5% for the next 3 years. Sterling took an immediate hit on the news by falling to £/$1.5740, it remains to be seen whether this signals a trend change moment, however for now my Sterling forecast remains for GBP to target a volatile up-trend to £/$ 1.85 by mid 2011(04 Oct 2010 - British Pound Sterling GBP Currency Trend Forecast into Mid 2011 ). My next analysis will seek to come to a trend conclusion for UK interest rates for 2011 in light of another year of high above target inflation and weak economic growth. Ensure you are subscribed to my always free newsletter to get this analysis and forecast in your email in box as well as my next ebook on the Real Secrets of Successful Trading which will also be made available for free (Anticipated March 2011). 26 Jan 11, 02:41 More money printing? Could this contraction point to QE2 being announced soon here in the UK ? You have been spot on with your analysis of UK inflation since I have followed you. Sadly I can believe how incompetent the main stream press are I am just grateful we have your articles to read here! The Bank of England will announce QE2, then QE3, then QE4.... over the next 3years. Surely at this point it is just a question of timing as to when we have a serious crisis in sterling? Maybe Iam overly pessimistic but I just cannot see anything on the horizon that could trigger any sort of real recovery. Malaise as far as the eye can see! Many thanks by the way for a really excellent website. A PS to my previous note, it is not a sterling crisis as such Iam worried about, as we have had loads of those over the years. What worries me is that what starts as a vanilla currency crisis may mutate into a hyperinflationary collapse. Does this worry you at all? Once again many thanks. All currencies are in freefall (INFLATION), the exchange rates just show the voltaility in the differing rates of free fall. I expect sterling to rise against the dollar because the dollars rate of decent is expected to be greater than sterlings. Hi Nadeem great analysis, and you are spot on practically most of the time, but your analysis worries me, if GDP will rally to around 3% or so in 2015, when will unemployment fall back to 2006/2007 levels seeing as it is a lagging indicator. In essence isn't it really a complete lost decade the subprime crisis began in 2007, unemployment according to the analysis you have done wont fall back to pre-crash levels until at least 2016 so a lost decade? The problem is that as a consquence of being in the EU, approx 70% to 80% of new jobs go to migrant workers. With the PIIGS in depression, then this is liekly to continue for the next 5 years and probably beyond. So yes, where jobs is concerned there is NO fall back to pre crash levels over the next 5 years at least, unless something happens to change the status quo with regards migrant workers and completely freeing up small companies to hire workers because the current system ensures many small companies (hundreds of thousands) WILL NEVER EMPLOY WORKERS from the general pool, but rather family members, because of the rules, regulatiosn and risks of litigation. In Britian the lawyers are out of control vultures that feed on any crap such as the Accident Claims, or employment tribunals etcs, unless fundemental changes are made to many aspects British law and regulations then unemployment won't fall.